1. 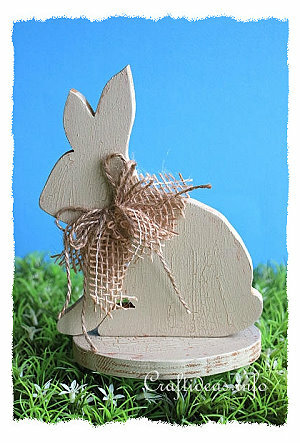 Print out the bunny pattern to to a size you would like to make and transfer shape onto the wood. The size of the base will depend on the size of the rabbit. It should be at least the width of the bunny measurements. 2. Saw the pattern out and sand it down until all of the rough and frayed edges are gone. 3. 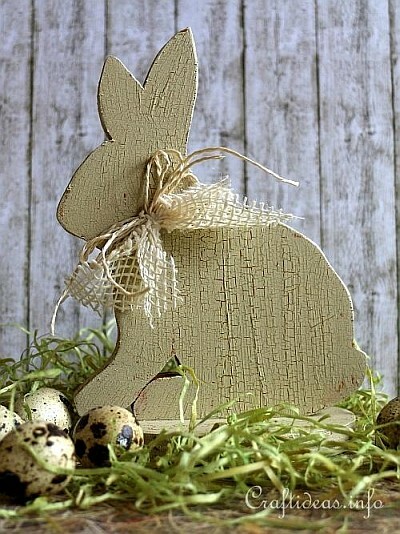 Take your brown paint and apply a coat of it to all sides of the bunny and the base. 4. Once the paint is dry, then apply an even coat of crackling medium over the entire bunny and top and sides of the base and let it thoroughly dry before continuing. 5. Now you can add a coat of beige paint to both pieces. When adding this coat, make sure to only go over an area once with your paint brush. If you go over a same area twice, it will ruin the crackling effect of that area. Let the paint dry. 6. Drill a hole through the center of the base and the center of the bottom of the bunny. Countersink the hole in the base. Then screw the base to the bunny. 7. 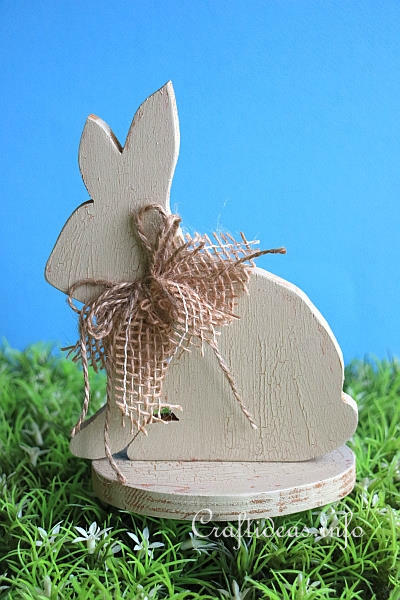 Create a bow around the bunny’s neck using the mesh ribbon and jute cord.